Ever since my husband graduated from law school he has been studying for the bar exam. 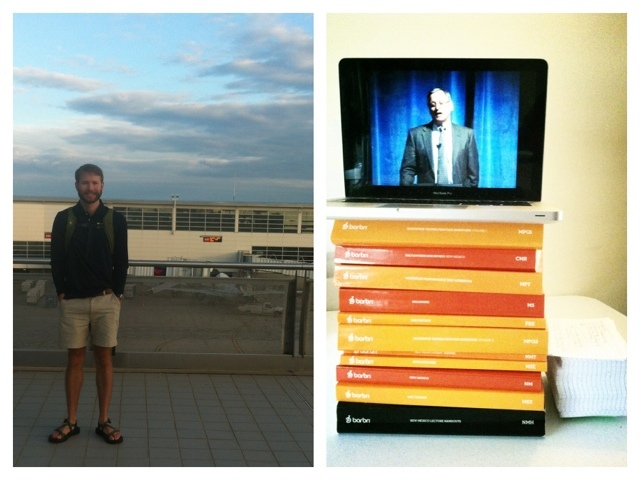 Most people think graduation equals freedom and money, but for my sweet husband, it only meant longer hours of studying. Thankfully (I guess…), the bar exam is only a few days away. All day Tuesday and Wednesday my husband will be answering questions about constitutional law, criminal procedure, evidence, real property, torts, administrative law, agency, community property, corporations, equity, family law, federal jurisdiction and procedure, Indian law, partnership, secured transactions, trusts, and wills and estates. I am so proud of him and all of the work he has accomplished. It is a really good thing that he has such a big brain, because God knows that I wouldn’t be able to hold that much information in my head all at once! Take a look at his stack of books and note cards... in addition to going through every single page of these books, writing all of these note cards, and sitting through over 100 hours of online Barbri lecture – all within the past two months – he has managed to do it all with a great attitude. I am so thankful that God blessed me with such a hardworking and intelligent man.